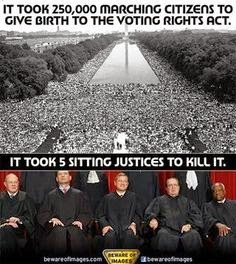 Are Americans waking up to the depredations against democracy being committed at the Supreme Court? Maybe so as the title to our post today says it all in a piece by Chris Geidner at Buzzfeed.com, "New Poll: Americans Think The Supreme Court Is Political, Closed Off, And Got Citizens United Wrong," and "Only 36% of Americans believe the justices usually decide cases based only on the law, according to a new poll being released Wednesday. 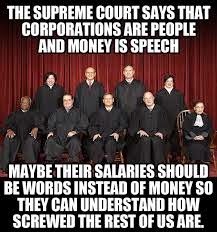 "WASHINGTON — Only about a third of Americans believe the Supreme Court decides cases based on the law alone, according to new polling data about the court. 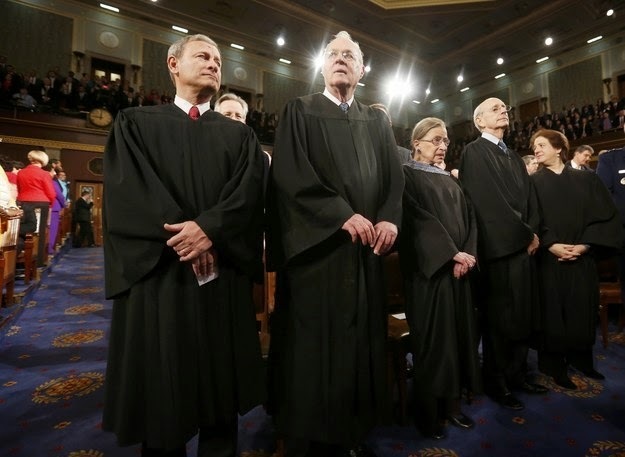 "According to the new poll, Americans believe the Supreme Court justices are political, letting their personal views sway their decisions — an opinion held across party lines. 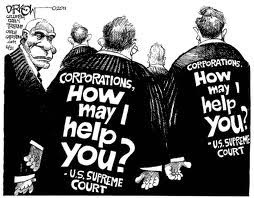 And more than three-quarters of Americans oppose the Citizens United ruling four years after the Supreme Court handed down the landmark campaign finance decision. "By large margins, Americans say they would also like to see more openness and accountability from the Supreme Court — on topics from access to courtroom proceedings to financial disclosures and ethics rules — as well as an end to lifetime terms. "The polling, done by Greenberg Quinlan Rosner for Democracy Corps and provided in advance to BuzzFeed, comes as the justices are considering the final cases of the term, all of which are expected to be decided by the end of next month, and tracks with other polling from Pew and Gallup showing the court’s favorability at historic lows. "In mid-April, the Coalition for Court Transparency asked the court “to consider making the live audio feed of oral arguments publicly accessible” in letters sent to the justices — a move that the new polling shows is supported by 67% of Americans. An even greater portion of respondents, 71%, said television cameras should be allowed to record and broadcast the proceedings live. "In response, 80% of Americans opposed the decision and 18% supported it. Although Republicans (72%) were less opposed to the decision than Democrats (82%), it was Independents (84%) most opposed to the decision. 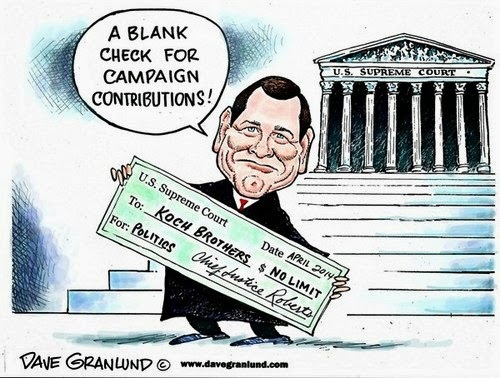 "Of the recent decision in McCutcheon, pollsters told people that 'the Supreme Court recently overturned a law that had been on the books for the last 40 years that limited the total amount of money any individual may donate to all federal political campaigns and political parties in a single election cycle.' A slight majority of respondents, at 51%, believed the decision would lead to more corruption, though many, at 38%, believed it would make no difference. Only 8% believe the decision will lead to less corruption. "As with Citizens United, Independents are most opposed to the McCutcheondecision, with 56% believing it will lead to more corruption and only 5% believing it will lead to less corruption. Democrats are 52%–11% on that count, while Republicans are 47%–12%. 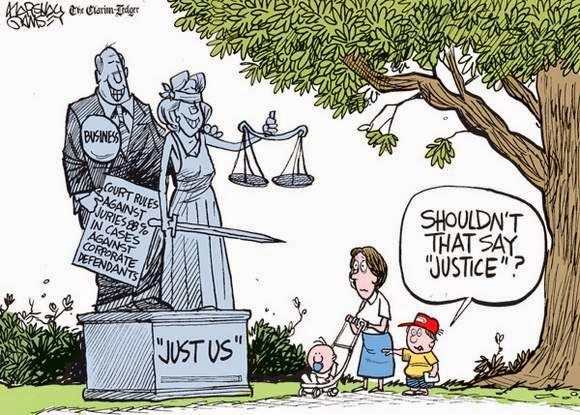 "A majority of Americans, per the polling, also strongly support ending the lifetime tenure of justices. In questions split between the respondents, half were asked whether lifetime tenure should be changed to a fixed 18-year term while the other half were just asked if lifetime tenure should be ended and replaced with a fixed term. The total support for ending lifetime tenure, depending on the wording of the question, is at least 70%, with “strong” support being at least 53%. "The polling is based on a survey of 1,004 Americans over the age of 18, conducted from April 16–24. It has a margin of error of 3.1% at the 95% confidence level." 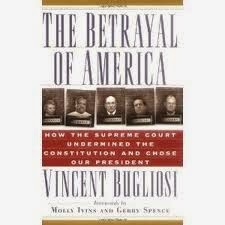 It's time to re-read Vincent Bugliosi's book, The Betrayal of America, on the 2000 judicial coup de etat by the Conservative faction in the SCOTUS that put one of the worst presidents in our history in place -- for the scathing version he wrote for The Nation, "None Dare Call It Treason," click here --> http://www.thenation.com/article/none-dare-call-it-treason. In real estate it's location, location, location and in politics it's timing, timing, timing. If the House weren't under the control of the Conservatives this would be a perfect time to impeach the Fascist Five. 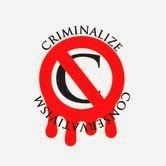 For those who can't wait until Conservatism is criminalized, you might try kicking them out by voting this year, though traditionally Democrats stay home in mid-year elections along with the Low Information Voters. or the Religious Right. It's not a conservative issue at all."